This is my front hallway. I am thinking of doing a gallery style down the left hand side. And perhaps just two large pictures on the right. You may find you won't need anything opposite. 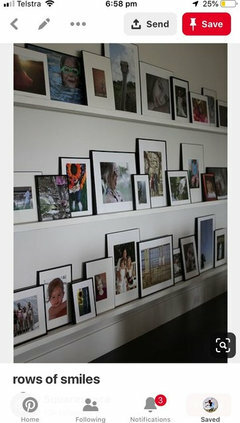 We had a gallery wall, but our hall was 1200 wide, which helps. But we have just moved and I want to do it again, but 900 hall. ..So on a smaller scale. 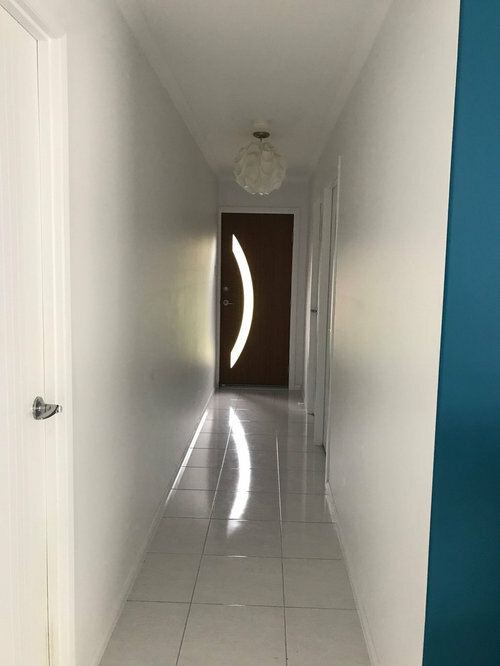 How wide is your hallway. I think it would look too cluttered. 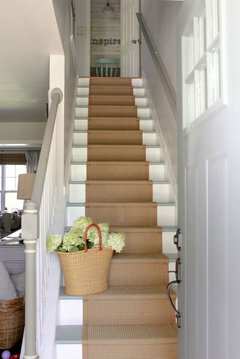 If your hallway was 1500mm or wider, then yes. 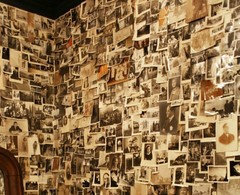 But if it is only 1000mm or less, then occupants and visitors may be knocking all the pictures off the walls. And with a long hallway, you will never actually see the pictures unless you stand still in the hall. 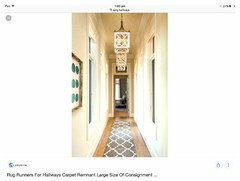 One or two large pictures on one wall, some pendant lighting, and a hall runner may be better. In my opinion. You could do some wall paper to give it some depth like this whitewash wood...Add a montage of photos... or one or two large contemporary paintings ... Maybe instead of a hall table you could source a long very narrow timber stool either natural or painted blue/grey/white &amp; display sea themed items on top &amp;/or baskets underneath for storage &amp; a large painting or two on the wall. Picking a colour scheme to complement what you have already &amp; using that in the art but keep it simple as the hall is not that wide &amp; something at the end to draw the eye to the end like a mirror or more art on that narrow wall beside the door.Have fun! 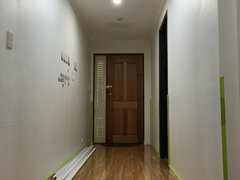 Advice on hallway light please!?! You are on the right track... as you have it laid out at the moment I would agree that either the top or bottom need to line up. Otherwise if you want a less structured look you need to make it more obvious. I like the idea of black and white images... however coloured okay if you can keep the colours balanced. Try it, you can always fill the nail holes in with toothpaste! 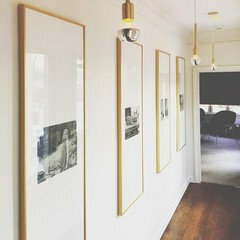 I think by using same size frames for your artwork it will look more stylish and less cluttered, a few inspiration photos for you. Thanks Julie! Perhaps I could try that!! What if I just had one row like this? Still too much? 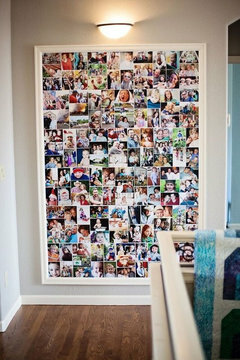 I think the more uniformed the more stylish the look, choose your favourites and frame them in same frame size, it will be more pleasing to the eye than having a cluttered space that loses interest, you could always do a collage with your other photos for another room. Ren Ren lol. How gorgeous. Do what Julie said. That wall with the same size & type of pic looks stunning! 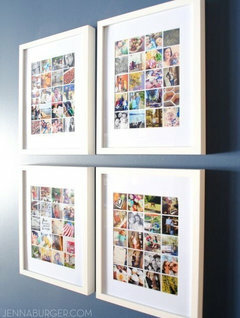 Hi there, it very much depends on what you are putting inside the frames - plain black/white prints or multicoloured? 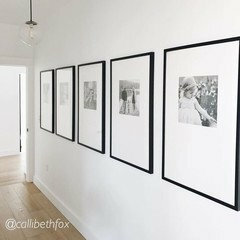 I like the natural timber frames which will add warmth and look fantastic with a black & white print, especially as there is a lot of white already in the walls and floors. 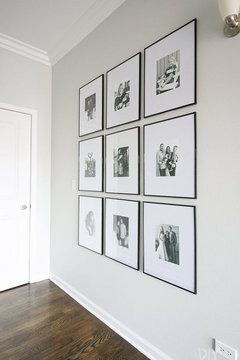 If you are having black and white prints I would suggest instead of the three colour frames combo having mainly the timber, with two or three of the black frames, and then balancing the look with a natural seagrass or sisal runner which will echo the tone of the timber frames and add further warmth to the area (you can also get black edging on sisal runners which looks very elegant and would tie in with the black frames). But if your prints are multi-coloured then keep the timber frames but swap the few black frames for the white frames instead - and Id still consider the seagrass runner as I really think it would beautifully compliment those timber frames. I will be putting a verity of coloured prints, so I think you’re right, frames of all the same colour will work best. I just think frames all the same size are boring, but perhaps you’re right in that in might look cluttered in such a small space. Julie has given very good advice, go with it. 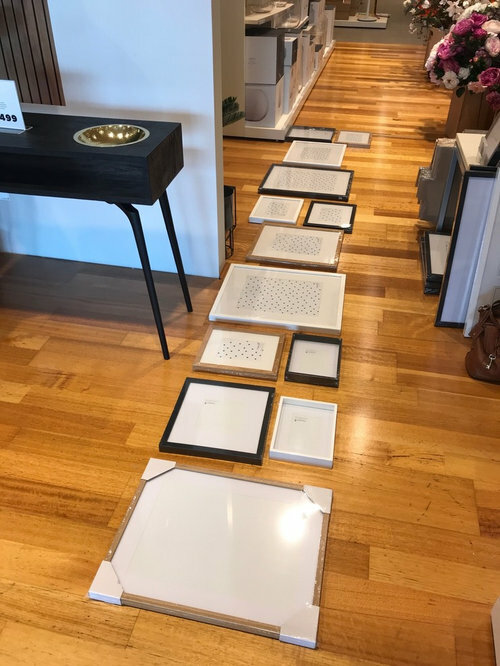 I had the same problem, Anzella - what to do with a long, empty hallway - without closing it in, and without multiple pieces of art work and frames blowing the budget, but whilst also avoiding one or two pieces looking disproportionate and there still being big blank spots. It’s not totally finished off yet, but this may solve some of your probs too. I bought a mitre saw and did it myself - so anyone can do it! I sold the saw as soon as I finished with it, so even cheaper than hiring! Thanks, anzella. I’m pretty rapt with the outcome so far. I’ve only just done it. I still have to pretty it up with a few ornaments, fill and paint some gaps etc, but it’s getting there! I got so keen to see a glimpse of the end result I skipped a few bits! 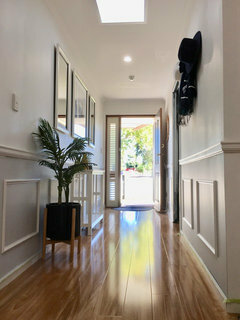 The big advantage is the faux wainscoting makes the whole hallway look decorated, as opposed to just one wall, or one little area. And a friend said it definitely makes the hall appear wider as well. (I was concerned it would close it in). The job really didn’t take that long, so don’t be too put off. 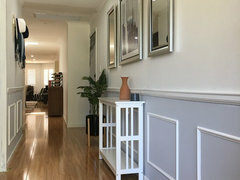 I spent more time measuring and re-measuring and recalculating and triple checking the size of the wainscoting frames and the gaps than anything else. The trick is to make sure the gaps between the panels are all the same. Check out some how to’s on YouTube. I opted for quite wide (630mm) frames with a 270mm gap. 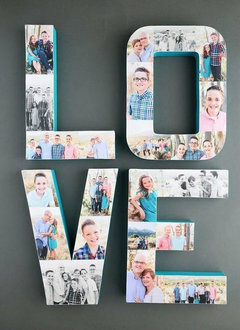 This gives the illusion of more space; well, compared to the examples that have smaller frames and are only 100mm apart. I thought they looked a bit too ‘busy’. I was nervous about using the saw, but it turned out to be very easy. I still have all my digits! Liquid nails and a spirit level took care of the rest. I’d never worked with timber before, so if I can - you can too! I prepainted the timber before it was cut, and pre-assembled the frames prior to gluing them to the wall. And it wasn’t an expensive project either. Even the extras were cheapies. The narrow hall table is a Hayman from Fantastic Furniture $89, Target pot $39, Target rattan circle $20, Kmart hat rail $11 + about $15 for a couple of hats to throw on it. Sing out if you’re thinking about doing anything similar and have any more Q’s. Wanna see something really scary? 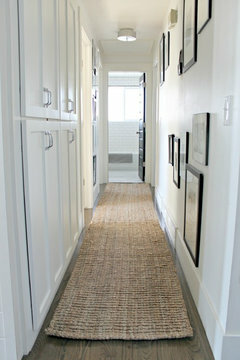 Check out what the hallway looked like before the floorboards and skylight! Big diff. Huge!